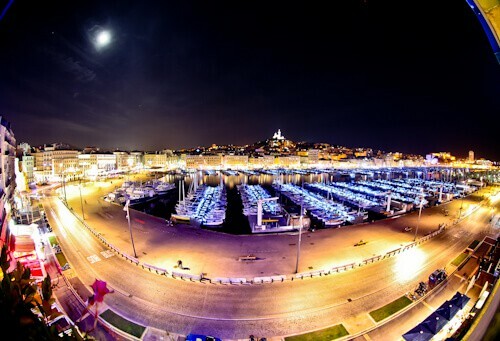 The most convenient place to stay in Marseille is the Old Port. I stayed in a hotel with balcony views of the Old Port and Notre-Dame de la Garde. 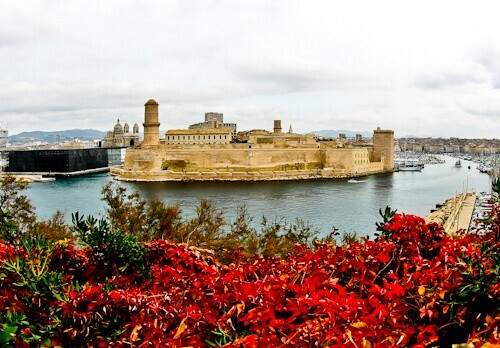 The whole bay of Marseille is on the tentative list to become a UNESCO heritage site. Maybe in the future it will become one. You can see the Notre Dame de la Garde from most points of Marseille. It is built on the highest point of the city. It was built in 1864 on what used to be an ancient fort. On top of the church is a Madonna and child covered in gold leaves. The statue is 11 meters tall and visible from the Old Port. From the Notre Dame you get a wonderful panoramic of Marseille and the bay of Marseille. You also see what is at the other side of the hill which is more of Marseille. Marseille is huge and the second largest city in France. Should I feel guilty for enjoying the view of Notre Dame from my hotel room and not walking up there? The Old Port is known in French as Vieux Port. Around the Old Port you’ll find lot’s of bars, restaurants and activity. There is an interesting reflecting mirror which makes it look like people are walking upside down. Many boats leave from here to the islands. The most popular boat tour from Marseille is to the Massif des Calanques. The Massif des Calanques is a national park with some of the most beautiful coastline you’ll ever see. 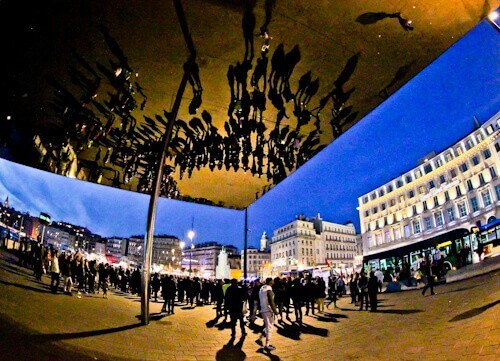 In 2013 Marseille was the European capital of culture. The museum of European and Mediterranean civilizations was built as part of the event. It’s the first national museum to be built outside Paris. The modern museum is linked to the 17th century Fort Saint Jean by a high footbridge (above). As the name suggests the museum is about the history of European and Mediterranean cultures. The unique structure is a cube surrounded by fibre-reinforced concrete. It is claimed to be made of stone, water and wind. The French are good architects so I believe everything they say! There is a restaurant on top of the museum which offers panoramic views of the Old Port and the Corniche. Marseille Cathedral is directly opposite so you get a good view of this too. Palais Longchamp looks like it should be in Rome! It was built in the 19th century to celebrate the completion of the canal of Marseille. In the center of the building is the water castle. This is a huge water fountain leading to the pond. Inside the Palais Longchamp are 2 museums. The museum of fine arts and the natural history museum. 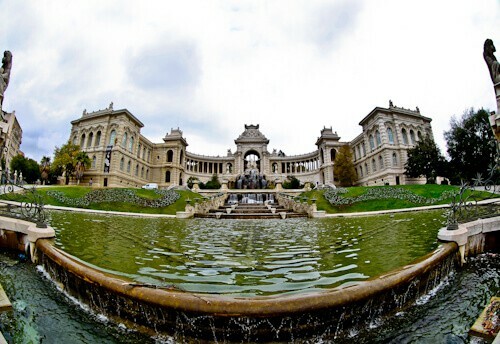 The palace is located in Longchamp park which is one of the best parks in France. Marseille cathedral is considered to be one of the most beautiful buildings in France. This means that extra effort is made to light it up at night. It was originally built Romanesque style in the 12th century. In the 19th century it was modernized to be what you see today. It is known in French as the Cathedrale de la Major. It is 70 meters high with a capacity of 3000 making it one of the largest cathedrals in France (and Europe). The cathedral is very easy to photograph. It is surrounded by open spaces and plazas so there are no obstructions. The best time to photograph it is at night when it’s beautifully lit up. Marseille is very proud of this cathedral! Fort Saint-Jean was built in the 17th century. There is another fort guarding the Old Port called Fort Saint-Nicolas. 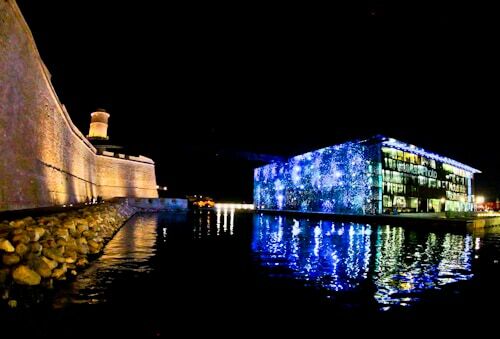 These forts were designed to be a majestic entrance to the Old Port which Marseille is so proud of. They were actually built not to defend the city but to defend the mayor of Marseille at that time. He had the cannons facing the city to defend himself from the people. For a time during the second world war the forts were under control of the German army until liberation in 1944. In the 1970’s the forts were then restored to what they are today, tourist attractions. Fort Saint-Jean is best photographed from the other side of the port at Emile Duclaux park. You’ll also get the Old Port, Marseille Cathedral and the museum in the picture. If you’re lucky Olympique de Marseille will be playing at home whilst you’re in town. You can take a metro to the stadium. If they are not playing but you still want to see the stadium then you can take a stadium tour. Even if you’re not interested in football the Orange Velodrome is one of the most unique stadiums in the world. A visit to this stadium would be good for your Instagram feed! The Flixbus arrives and leaves Marseille from Saint Charles train station. There are regular Flixbus services between Marseille and Nice. Journey time is around 3 hours. The route through southern France is a beautiful one. With Flixbus each seat has its own power outlet and seatbelt. You also have access to free WiFi throughout the trip. I would love to one day visit Marseille – sounds so interesting. Great to know that you can see the Notre Dame de la Garde from most points around the city. Would love to try and capture it on camera from different angles. You totally love stadiums – and I must say from reading your blog, I have totally grown a fascination for stadiums. So much thought and effort is put into its architecture. 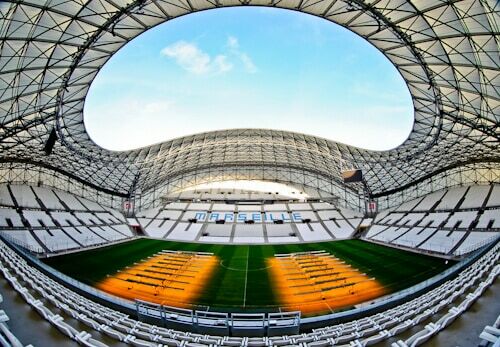 Your snap of the Marseille stadium looks amazing – what a grand place to visit. I haven’t looked into visiting Europe, but this post made me realize I should start. Architecture looks stunning, especially the Palais Longchamp. I would love to photograph it. This is a great review and I’m glad you enjoyed Marseille. I always associate Marseille with The Count of Monte Christo. I guess I also thought of it as more of a dirty-port-town, but that’s also because I’ve never been there personally. I can’t wait for the day when I can visit and change my perspective. I don’t think you should feel guilty just because you had a killer view of the Notre Dame de la Garde. Sounds like a killer spot! Love your night photographs! The view of the port at night is just splendid! Good to know there’s a Notre Dame Cathedral here too! The Marsielle Cathedral looks stunning. Wherever there’s Flixbus its just a blessing! France is somewhere I haven’t yet visited yet but really want to! Marseille looks beautiful, I had no idea it was the second biggest city. Thanks for the tips to make sure that when I visit, I have an idea what to see. I love your pics in this post too! Fort-Saint Jean looks beautiful. I was speaking with a friend about Marseille the other day and he said that there’snot much going there. I believe your post has challenged that and there seems to be quite a bit of cultural and architectural sights to admire. The photos are amazing especially the night ones and glad to see you include a stadium shop which is slowly becoming your trademark. 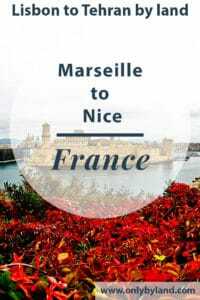 I have not visited much of France and Marseille is now going on my list. Love the photography tips you provided. It helps to know the best vantage points. The cathedral and Fort are both beautiful and I think my husband would enjoy going to the stadium. I was thinking of visiting Marseille this year when we visited France, but we didn’t end up going there. It is such a beautiful port city – day and night! I think it would be really neat to check out the restaurant at the top of the Museum of European and Mediterranean Civilizations! Just looking at things to do in Marseille with my boyfriend. I don’t think I could watch a match but the stadium tour is something I’d agree to do with him to keep him happy! The view from the balcony of the hotel looks amazing, I think I’d enjoy the view of Notre Dame from there too instead of climbing up! Thanks for the information about Marseille, I had no idea what to do there! At least I know some of the basics – and of course I’ll arrive and leave on the Flixbus. How easy is it to get from the Flixbus stop to the port? Hi Toby. It’s a 15 walk from the Flixbus stop which is right next to the Saint Charles train station. It’s an easy walk to the Old Port as it’s downhill! This is a great recap of the major sites. I like the recommendation for the bus line too. We’re headed to Europe in the Spring so this is great information to have. Thanks! We haven’t visited France beyond Paris yet, but we’re dying to go soon! Marseille is definitely on the list: cathedrals, wine, beautiful architecture–it has it all. Fort Saint-Jean looks amazing, that will definitely be on our list! 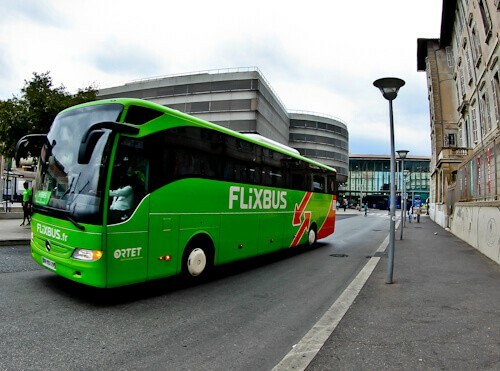 Flixbus is such a handy service for traveling around Europe–the price can be SO much more affordable than trains, and the Flixbuses we have been on have been very comfortable! Marseille seems to be hot at the moment! I have read a lot about it lately. The places in your photos look lovely. Your photography is excellent! Looking at a cruise that goes to Marseilles so have pinned post for future reference. I really loved Marseille which seems like it’s shaken off its negative reputation and has become a really cool and vibrant city. I didn’t make it to the palace but that looks amazing and something I would love to do on a future trip. Awesome that you got a chance to go and see the stadium too! 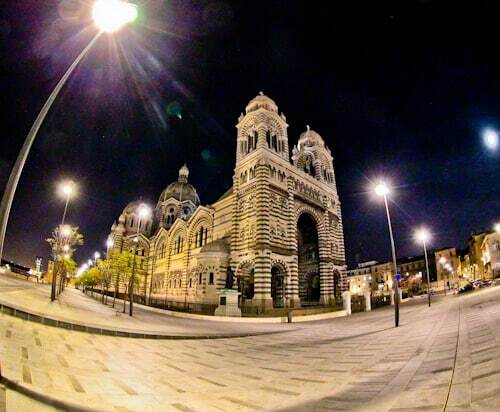 Marseille looks amazing with your stunning photos! I would love to see the palace. The bus to Nice looks easy to do. I must find a way to include this in my next trip to Europe. Marseille is such a beautiful city! I agree that several of the sites look like you’re in Rome. Marseille Cathedral looks stunning. Good to know that it is easy to photograph!